As Next Phase discussed two weeks ago, the world of early stage biotech and medtech investment is far less than straightforward and CEOs often have limited resources for learning where they fit into the capital landscape. In this article, we’ll look more closely at how LSN designed the LSN Investor Platform to address this problem. LSN has found that the biggest difficulty for fundraising executives is identifying active investors that are a fit for their stage of development and product. When raising a seed or series A financing, most executives go straight to a few brand name VCs and angel groups in their backyard, and, mistakenly, think this is going to get the job done. The reality is that fundraising is a numbers game, and there are thousands of groups across the world that are not currently known to the fundraising team, but may be a great fit for your venture. The problem is how to efficiently identify these groups, if they are a fit and, most importantly, how to reach them. Through this outreach, LSN has created the LSN Investor Database, giving fundraising executives the ability to generate a global target list of investors who are a fit for their company. Like all databases, there is a front end of the active players – which is approximately half of our total network– which includes profiles of firms in active dialogue with the LSN Research Team and profiles of firms that have enough publicly available information/contact details to be listed. The back-end of the database contains investors that have requested that LSN match them with fundraising companies but prefer not to be listed in the front end, investors we have identified but are not currently investing, and profiles that will be moved into the front end once we have enough data to justify value. The good news is that we think we have identified about 85% of the global early stage investors. The functionality of the LSN Investor Database allows you to easily apply filters to generate a list of firms who are a fit for your company, which usually leaves about 300-500 firms as initial targets to begin initial qualification and potential interest. The LSN team has conducted an analysis of hundreds of successful fundraising campaigns and has determined that, on average, a start-up company can expect to spend between $70,000 to $100,000 on their fundraising efforts. These costs include: creating and maintaining your marketing materials and web presence, business trips, conferences, partnering road trips and other miscellaneous costs. The LSN Research Team has done the work for you to collect details regarding exact investment interests, typical allocation size, fund vintage, company management team requirements, past investment history, and personal contact details for Partners, Directors, and C-Level Executives at each firm – information that is rarely found in other investor profiles. The price of the LSN Investor Database includes: initial identification of our client’s global target list of 300-500 investors, a consultation on your introductory marketing materials (intro email and deck), campaign outreach advice, and email alerts including updates of investors added to the platform who are a fit for your company. Additionally, the LSN Investor Platform includes an export function that provides startup CEOs with data that can be imported into a CRM system to manage outreach and track the progress of every investor relationship. LSN has already integrated with SalesForce.com to make this process seamless for our clients. In total, LSN offers a complete package for fundraising executives to ensure they have the strategy and investor targets necessary to conduct a successful capital raise. In addition to the LSN Investor Platform, the RESI Conference is another tool provided by LSN for fundraising CEOs. The RESI conference allows entrepreneurs to meet face-to-face with up to 16 relevant investors in one day and begin to develop a personal relationship with them. Subscribers of the LSN Investor Platform have a powerful tool that allows them dig into the investors’ profile prior to the meeting to understand the investors’ interests and preferences, greatly increasing the quality of an intro discussion and making the best use of their face-time. Using the LSN Investor Platform and RESI conference in parallel creates a tremendous value for any fundraising CEO in the early-stage life science space by not only providing the connections, but also by facilitating face-to-face interactions. LSN estimates that approximately 250 clients who read our CEO’s book, The Life Science Executive’s Fundraising Manifesto, purchased the database, and participated in the RESI Conference Series have raised upwards of 350 million dollars. LSN’s value add to a fundraising CEO and scientist/entrepreneur is equivalent to 5 years’ work by 6 LSN research analysts, curating your Global Target List (GTL), which is at least 50% of the effort of raising capital – finding investors that are a fit for your stage of development and product. The personal connection between the LSN research team and an investment firm allows LSN to capture and utilize a unique flow of information and provides an unmatched tool for fundraising CEOs to understand the players in their space, their nuanced preferences/strategies and a way to begin a dialogue with them. No other service or data provider comes close to the focused, high touch, relationship-oriented nature of data collection and maintenance. 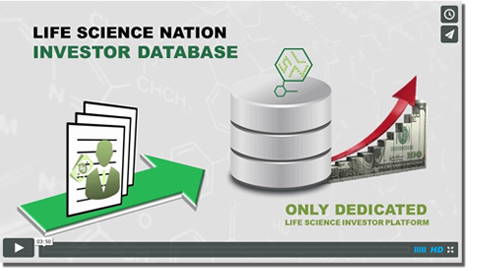 LSN created the LSN Investor Platform, which is the only early stage life science investor platform that goes across the silos of drugs, devices, diagnostics and healthcare IT. Over 600 clients have used this service, raising millions of dollars from investors located all around the globe. We’ve recently updated our video to reflect the latest generation of the cloud-based investor and strategic partnering database – take a look below! The majority of companies that we see at LSN have already secured some SBIR/STTR grant funding and/or have raised seed capital, generally from friends, family and angels (FFA). This funding tends to be used to cover incorporation fees, initial IP costs as well as some additional technical development to further de-risk their technology, making it more attractive for investors in a larger round. 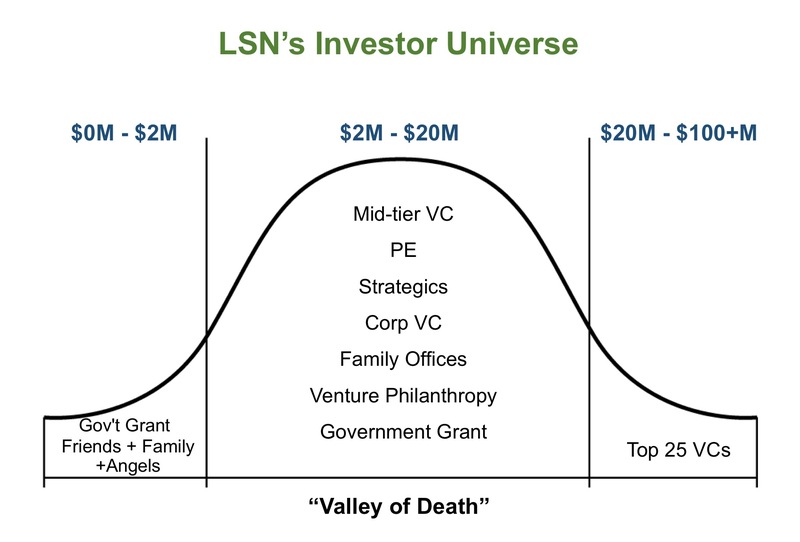 What comes next, and when most companies come to LSN, is referred to as the “Valley of Death”. This is the area between FFA and significant VC investment, a gap that many companies fail to bridge. If you are plugged into daily news on biotech and life science venture rounds (which I would highly recommend for any fundraising entrepreneur) it is not uncommon to see Series A’s to the tune of $20 million or more. What is important for entrepreneurs to understand is that these large rounds represent the minority of Series A investments. In LSN’s Financing Round Database that tracks life science investments we have identified 134 Series A financing rounds that have been made thus far in 2017. Of those identified raises, 85 (or just about 2/3) were under $20 million. 57 were under $10 million. What is also important to note here is that LSN’s data is comprised of financing rounds that have been reported, and in LSN’s experience many of the smaller rounds do not get reported. Therefore, there is a high probability that these stats are underestimating the number of smaller rounds. Of the rounds that raised $20 million or more, about 75% of them included what can be considered one of the top 25 venture capital firms based on total assets (AUM), investment track record, and name recognition. Many entrepreneurs are familiar with these VC’s, though few have real relationships with them. As a result, these VC’s have unprecedented deal flow allowing them to be extremely selective. Many of them are investing into companies in which they have been tracking the science and team since academia. In other words, unless you have a pre-existing relationship with these groups, truly getting their attention and having them take a hard look into your technology is a challenge, particularly if your technology description doesn’t include a hot topic word like immuno-oncology, microbiome or gene therapy. However, these high-caliber investors do show up at LSN’s RESI Conference events and you can meet them there, either via an ad hoc meeting, at a panel or in RESI partnering. Companies that land these large rounds with top tier VC’s often discuss how easy it was to raise capital. “I just called my old business partner at fund X and we had a term sheet in two months”. While this is great for companies that can raise capital that way–and if you can then by all means do!–it can create a false sense of what fundraising is like as these are the deals that generally get the most press. Additionally, many of these funds are so large that they look to put significant capital to work in each investment, so this creates an inflated sense of the size of typical Series A rounds. In general, I would suggest entrepreneurs looking to raise capital outside these big players to target whatever is needed to get to the next significant value inflection point. This helps broadcast your grasp on capital efficiency to the investment community, as well as an understanding of the space beyond the headlines. For companies that cannot raise from the top 25 VC groups, which represents the majority of rounds raised, they have a much bigger task at hand to raise capital then making a few phone calls. LSN’s Research team is currently in dialogue with over 375 investment groups looking for preclinical – phase II therapeutics companies that fall between angels and the top 25 VC’s. These include what we can call mid-tier or new VC funds, PE groups starting to look earlier, family offices now going direct, strategics, their corporate funds, and venture philanthropy groups. This is essentially LSN’s bread and butter; helping entrepreneurs identify and connect with these more low-profile investment groups. While it is a positive that there are so many of them, it does make fundraising a larger task when you have many more emails, calls and meetings to take before you can find a partner. For first-time entrepreneurs and those without deep networks into the VC community, the pool of capital represented by these investors outside the big-name VC firms represent your greatest potential chance of securing investment. Many of these VCs don’t have the same name recognition and established deal flow channels as the top 25 funds. If you can connect with relevant strategic groups, you will often find that they have deep scientific experience in your field as well as a need to fill their pipelines. These dynamics can all benefit the entrepreneur when looking to work with these less prominent groups, but identifying who these groups are and which ones are likely a fit for what you are doing is where the challenge lies. There is indeed life in the Valley of Death, and with the right tools and contacts it is possible to find investment. It’s a challenge, however, as anyone who has gone through the process will tell you. You need to really put yourself out there both on the phone and in person to start dialogues, get meetings, build relationships and ultimately sign terms. Click here for a PDF of the book “The Life Science Executive’s Fundraising Manifesto”. Click here to see a list of investors who are signed up for RESI Boston.